It was a wet old day in Cairns today, but it did stop for a long enough time for beautiful Mitch and I to go for a nice long walk. Stacey has done really well in training Mitch. He is a really huge dog (Long Haired German Shepherd) but he is extremely well behaved and walks great on a lead. He is just a big softy most of the time. On my “Pilgrimage to Self Discovery” I decided today to work on my work/volunteer decisions. So I did quite a lot of research into volunteering and even sent of an email expressing my interest. This volunteer position is to talk with the elderly about there past and present life and then putting together a “Life Book”. I am still not completely sure which area I would like to volunteer in, but I guess if I just keep on do my research the right one will jump out at me. I have thought I might like to also volunteer in an animal shelter. Tomorrow I am heading off for my few days further up north. I am so looking forward to it, as I have never been any further north than Cairns. This is all part of my “Self Discovery” adventure. “Davine Time” update: Today I spent a lot of time just indulging my thoughts on me. Hello Davine, Such a lovely dog. I'm sure you had an enjoyable walk. Brilliant you're considering volunteering. You really are going on an adventure. Enjoy the next stage of your travels. 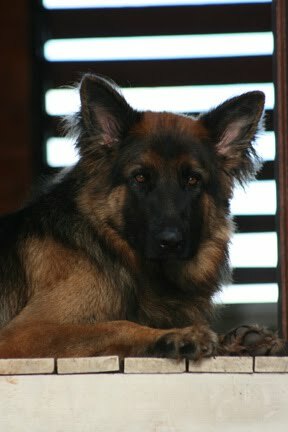 What a beautiful dog Davine. You're so right, when the right choice for you presents itself you will recognize it, it's going to be the one which makes your heart dance just thinking about it! Happy travels to you as you head further north.